The discriminator IC, a TK-10930, is a VSOP (Very Small Outline Package) IC. 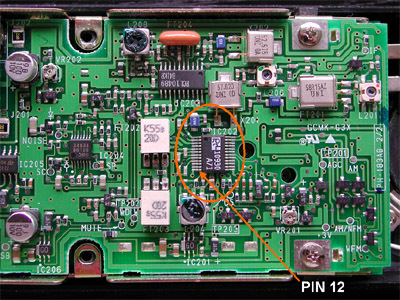 Its pins are spaced 0,5 mm (0.02''). A 'normal' SMD in SOIC (Small Outline IC), like the MC3361, uses a spacing of 1,27 mm (0.05''). Next, there is hardly any space for a chassis terminal. The scanner is filled very efficiently with three layers of PCB. The case fits almost seamlessly to the components mounted on the PCBs. 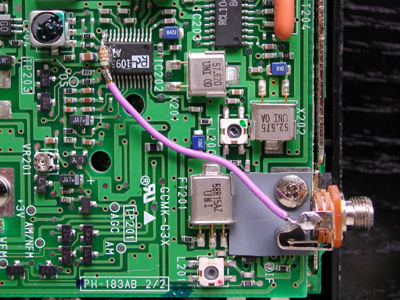 The receiver IC is mounted to the PCB that becomes visible when you remove the scanner's back panel. Pin 12 contains the demodulated audio. Luckily, this pin is situated at the end of the IC, and not between two pins. One lead of a 'safety resistor' of 12 k (the exact value is not critical, I use values between 5,6 and 15 k) is bent to follow the IC's pin exactly. Then, the resistor is connected a little to the outside of pin 12 using a fine tip soldering iron and a minimum amount of solder. The resistor is fixed to the IC with a drop of glue from a glue gun. This prevents damage to the IC pin when inadvertedly mechanical stress is applied to the resistor. The ground lug of the 3.5 mm chassis terminal is soldered to the scanner's ground. 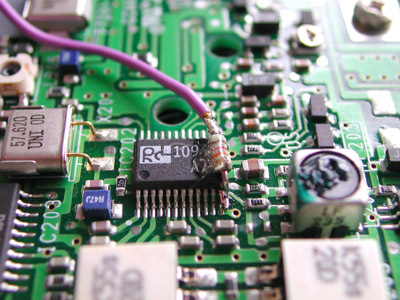 A small piece of insulated wire connects the resistor to the chassis terminal. A 3.5 mm terminal is just a little too large. I have milled a part of the terminal and of the plastic back plane to make everything fit. The second time I modified a '3000XLT, I used a 2.5 mm chassis terminal, which makes fitting everything together a lot easier. I used a piece of insulating material to keep the tip of a 3.5 mm plug free of the scanner's ground. In the final version, I have placed this material over the screw.